Hope you all saw the article in yesterday's newspaper! Never a good photo but always a good story!! We are getting the Headin ' South for a Cure story out there now! We have sent media releases nationwide and we are working hard to get some tv coverage - hoping that a morning show will pick up our story. One day to go until the crew fly to Brisbane to meet up with Tinka and Jase, who are already on their own road trip north. 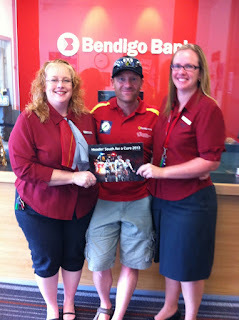 They drove over 1000 km yesterday and stayed overnight in Yass, one of our stopovers. 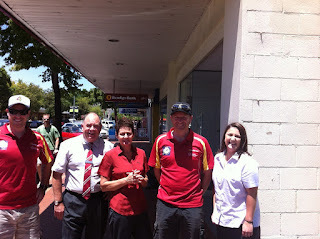 And were made very welcome by the locals there, including staff from Bendigo Bank and blokes from the CFA. Today they're catching up with a firie in Sydney then driving 1200km to get to the Gold Coast tonight! Great work guys, stay safe. See you at Brisbane airport on Sunday arvo!